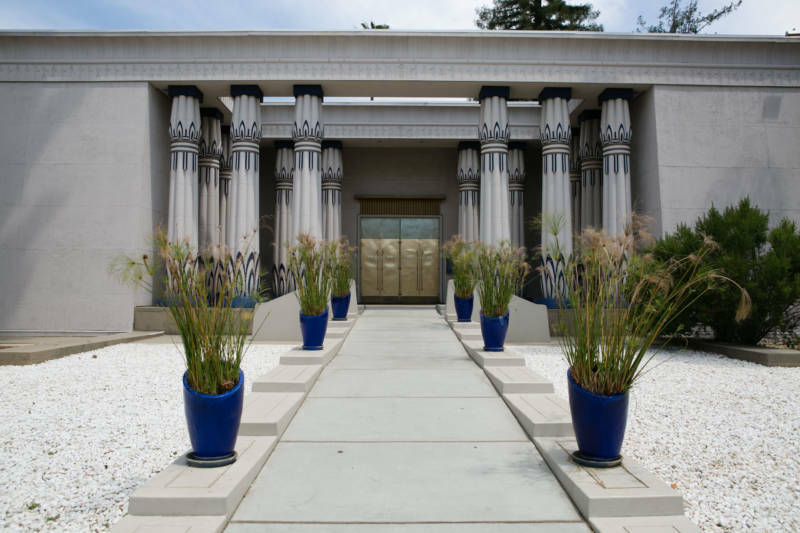 If you attended sixth grade anywhere in or near San Jose, there’s a high likelihood you've been to see the largest collection of ancient Egyptian antiquities on public display anywhere west of the Mississippi. I'm talking about the Rosicrucian Egyptian Museum. Peggy Tran-Le visited as a teenager, but she still has questions. Sooooo many questions. "Why San Jose? How did they get those mummies? How did those mummies get out of Egypt? And why is it not — I mean, maybe I’m mistaken, but — why is it not better known?" To find the answers, I joined her for a visit to the museum. The entrance is lined with huge columns, potted papyrus and rows of ram-headed sphinxes — just like the ones lining the processional road to Karnak. Then, you open the giant brass-plated doors, and you see sixth-graders. Lots and lots of sixth-graders. 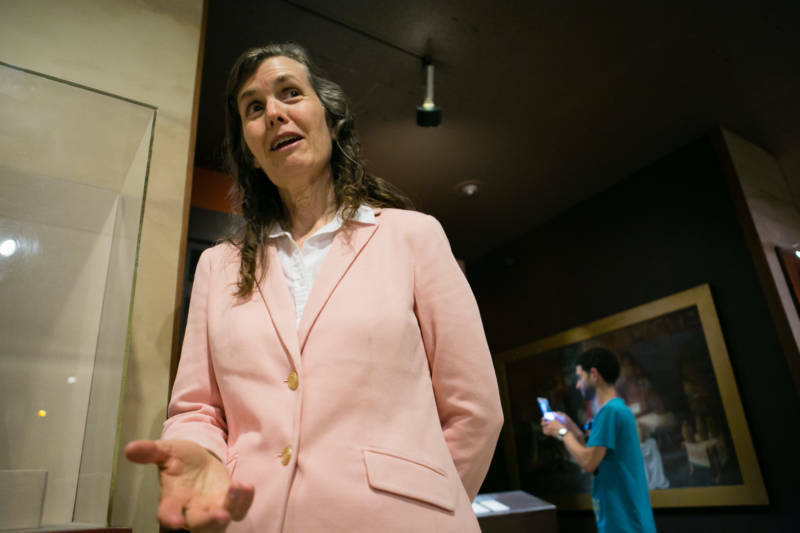 "We host 110,000 guests per year, and about 26,000 of them are sixth-graders," says Julie Scott, executive director of the Rosicrucian Egyptian Museum. As it happens, Scott is also a practicing Rosicrucian, which is to say she belongs to a philosophical society that believes there’s a spiritual, transformative value to nerding out on ancient Egypt. "I’ve been to Egypt 12 times now," she says. "There’s always something fascinating to learn and discover." Rosicrucianism in its modern form bloomed around the turn of the 20th century, along with a host of other metaphysical philosophies seeking to plumb ancient depths for fresh perspectives on the mysteries of life and nature. 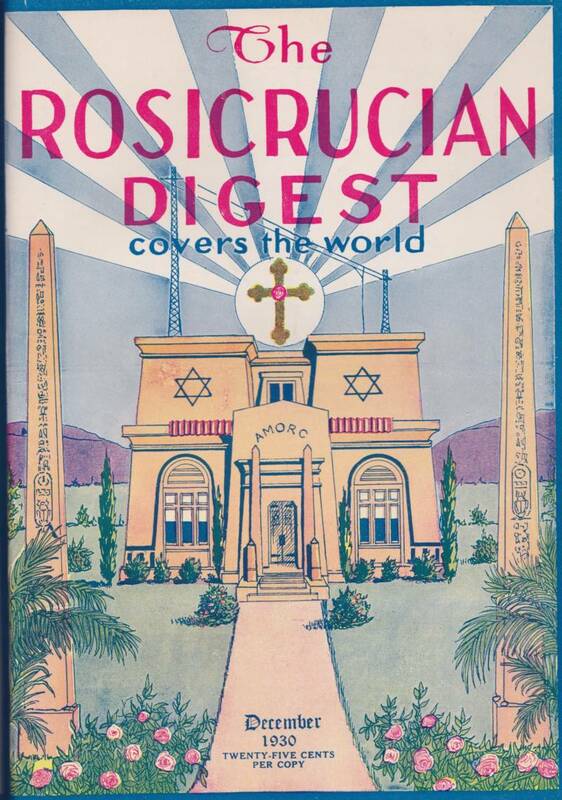 Local Rosicrucians began collecting ancient artifacts in 1929 and just kept going. There’s room after room of more than 4,000 statues and maps and mummies: human and otherwise. 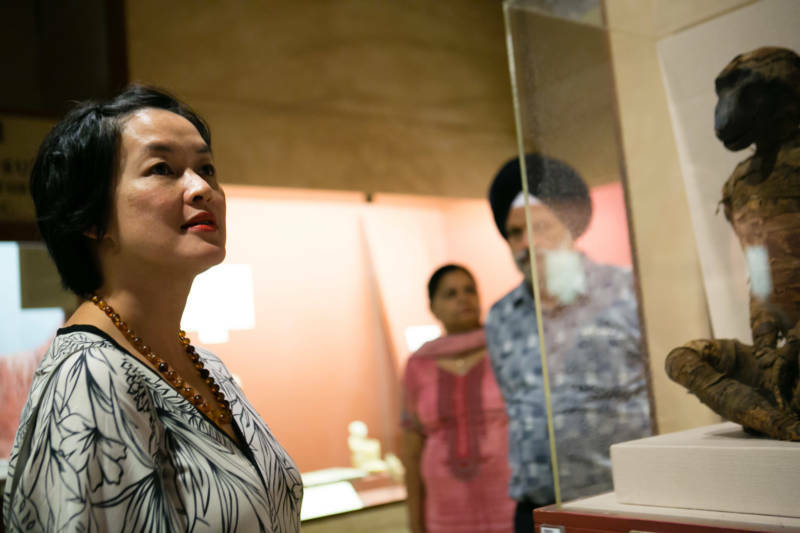 "I think as a teenager, the animal mummies were the highlight of my first visit," Tran-Le says. Over the years, the museum has modernized to take advantage of advancements in science. Egyptologists have visited and reassessed various items. As an example, Scott tells me the back story behind a baboon mummy that captures my attention. "So, this baboon, he looks — he is ancient, but he’s not a baboon," Scott says. "We found, after doing an X-ray of him, that the body is actually a ceramic jar. The Egyptians would do this. They would put just a small piece of an animal, say, part of a bone or some of their fur, in this votive offering, and that way they could make more votive offerings." To enhance the educational purpose of the collection, the Roscicrucians have also had a few replicas cast of famous items like King Tut’s golden sarcophagus and the Rosetta Stone. There’s also a tomb that is a composite replica of several real tombs in Egypt. "In 1966, a team of Rosicrucian researchers went to Egypt and explored a number of tombs in the Beni Hasan region," Scott explains, adding this tomb was most like the one of a man who was named Khnumhotep. He was not a pharaoh, but a nomarch — a governor, like Gov. Jerry Brown. The tomb is located at the end of a series of winding stairs, not unlike the line you travel through to get to the Indiana Jones ride at Disneyland. Ask people what they remember from their childhood visit here, and it comes down to the animal mummies and the tomb. There are lots of thoughtful, even funny, touches. For example, the sarcophagus in this tomb is missing because it was “robbed,” as so many ancient Egyptian tombs were. Also, the lighting is low enough to encourage young minds to think anxious thoughts. "I have to say that this part of the museum always scared me as a kid," Tran-Le says, laughing. "It’s such a, it’s a dopey reaction, but it scared me. So I’m having just sort of flashbacks to being a scared young person down here." 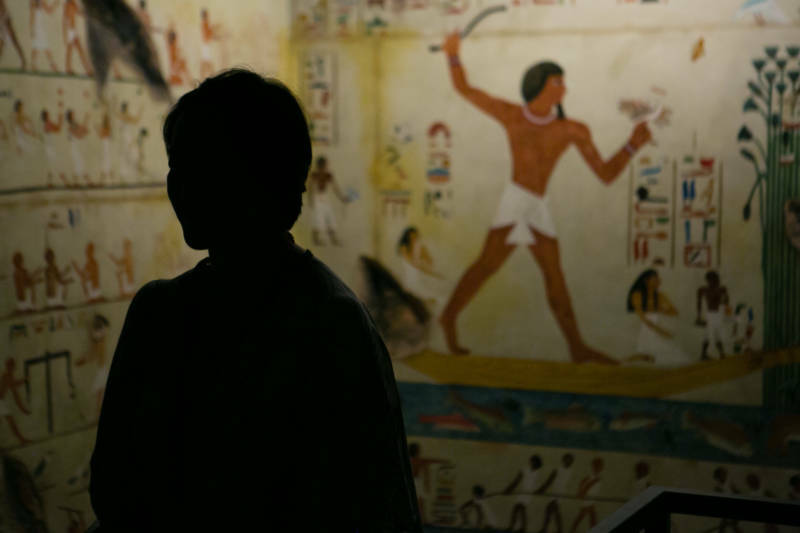 We retreat to another gallery focused on the daily lives of ancient Egyptians. As you wander through the rooms, you’re reminded of just how impressive, how sophisticated they really were. They brewed beer, as we do today. They worshipped cats, as we do today. They kept their kohl, their black eye makeup, in cylinders that look just like mascara containers today. The museum is the crown jewel in a complex that includes a planetarium and a research library with ancient books from big names like Francis Bacon and Isaac Newton, who the Rosicrucians of today claim as their own. "Isaac Newton had the largest collection of alchemical books in Europe," Scott says. "But he had to keep that private, because mystics at that time, they basically had to say, 'OK, I’m just focusing on science. I’m staying out of religion. You guys do your religious stuff.' 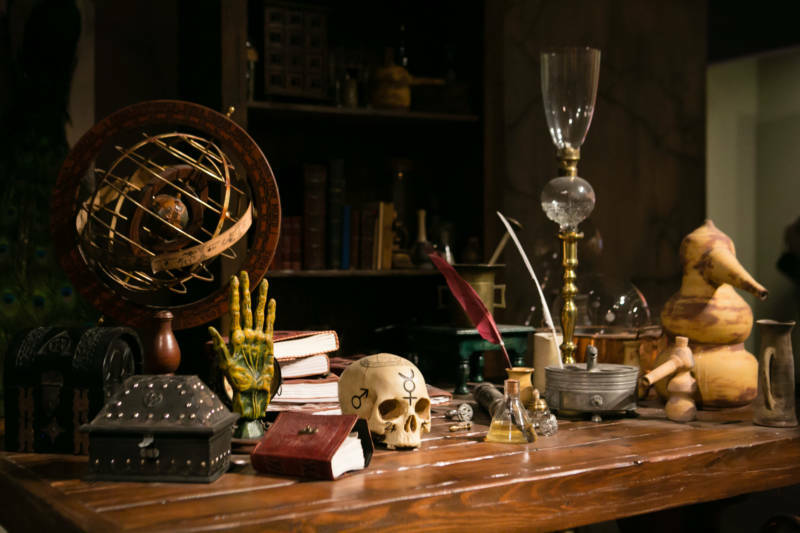 But he was a very avid alchemist." So, modern scientists have been able to turn baser metals into gold, but it's a hugely complicated and expensive effort that involves a particle accelerator. The kind of alchemy the Rosicrucians believe is possible has not been replicated by modern scientists. The local order of Rosicrucians has posted a number of videos allowing you to explore the ideas for yourself. "We don’t see (the pyramid) as a tomb," Scott says. "We see it as an initiation chamber." This line of conversation raises another question for Tran-Le: "When I came here with my friend’s mom and my friend, we walked the grounds and she said, 'Oh, this is where the order held secret ceremonies.' I don’t know if she was just trying to entertain a bunch of teenagers. Or is that something you can confirm? Or deny?" Scott explains: "Well, we hold regular meetings for Rosicrucians that include a meditation and a discussion. They’re private to only Rosicrucians. We wouldn’t call them secret, but you have to be a Rosicrucian member to participate. That’s held in our grand temple, which is for Rosicrucians -- that’s the spiritual headquarters, here at Rosicrucian Park." 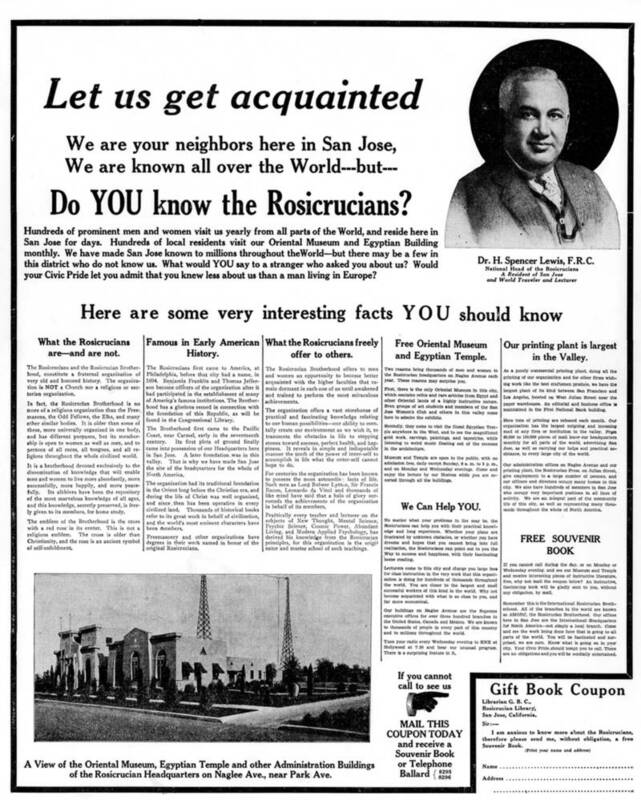 For many years, Rosicrucians advertised in popular magazines. Scott says there about 250,000 Rosicrucians worldwide, and other big centers like this one in France and Brazil. The New Yorker who started the U.S. chapter landed in San Jose's bucolic Rose Garden neighborhood because land was cheap here. Well, it was back in the early 20th century! Scott adds: "People in this part of the world are so open to other ways of thinking and learning — and especially to more than just intellectual learning and understanding." 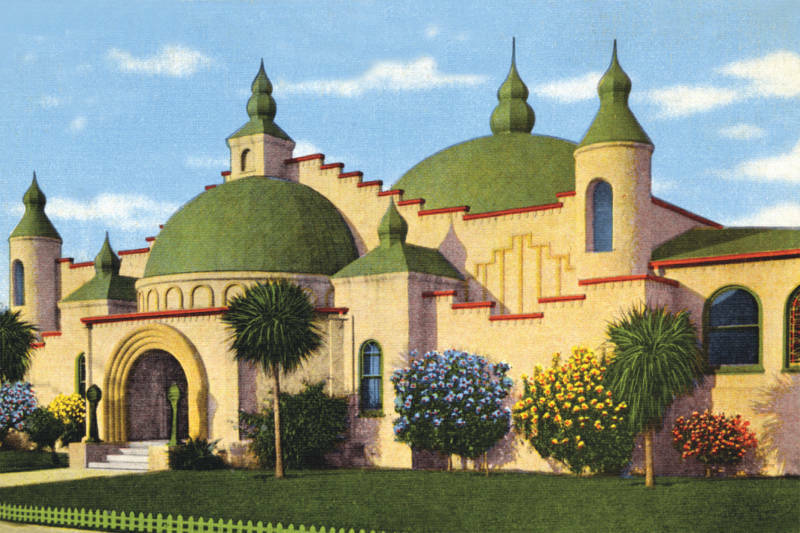 From the beginning, the Golden State has welcomed seekers, people keen to remake the world into something less rational and boring, into something more mystical and spiritually resonant. But if you’re thinking Rosicrucianism is a religion, it’s not. "I know Rosicrucians who are Catholics and Buddhist and Jews — every religion that I'm aware of, I’ve met somebody who is a practitioner of that religion," Scott says. "There are also Rosicrucians who don’t consider themselves religious at all. They consider themselves spiritual." Regardless, you don’t have to believe to benefit from the Rosicrucians’ enthusiasm for ancient Egypt. Anne Austin is an Egyptologist and archaeologist at Stanford who teaches a class called Egyptomania. She takes every class to San Jose. "I think it’s a great teaching collection, especially for people who are new to Egypt," Austin says. I ask Austin if some Rosicrucian ideas about ancient Egyptian practices diverge from accepted academic gospel today. "I think they’re open to a variety of interpretations of Egypt in a way that Egyptologists are less open," Austin says. "So we’re not really open to thinking about past lives in Egypt. We’re not really open to feeling a kind of spiritual, direct connection with Egypt. I do not feel a direct spiritual connection with Egypt." And the Rosicrucians, it’s fair to say, do.